The instrument that got most of my attention was the Guqin, a plucked seven-string instrument very elegant and beautiful that was already played by Confucius more than 2500 years ago. The open strings are tuned in a pentatonic scale and there are several common tunings (for a basic tuning in C the most common is G-A-C-D-E-G-A). It is a quiet instrument, tuned quite low (the lowest note is generally two octaves below middle C) and it has an amazing history and performance tradition. It has its own notation going back at least 1500 years and there are over 150 Guqin historical handbooks containing more than 300 pieces. This instrument has traditionally been associated with what in China are known as literati, or scholars. I had a few opportunities to enjoy live performances of Guqin and I recorded some samples in a store: 1, 2, 3, 4, and at a concert: 1, 2. The Guqin is generally played solo but at the concert I attended it was also used to accompany other instruments (1, 2, 3). In the context of CompMusic the Guqin offers a great example of a music with very unique characteristics. For example, the performance gestures are very much part of the music (1,070 different finger techniques are mentioned in an old handbook), the tablature used describes most musical elements except for the rhythm, the pieces are generally associated with poems, and most of the musical themes relate to nature. The music has a very strong personality and I was really attracted by it. One the oldest Chinese instrument is the Xun, with approximately eight thousand years of history. It is usually made of clay, is egg-shaped with a flattened bottom, with five to seven finger-holes and it is blown through a large hole at the top. It resembles the ocarina, but without the mouthpiece. I did not hear any live performance of it, but after seeing the instrument in many touristic stores and learning about its relevance in the traditional ceremonial events I bought one (picture). It looks very nice and it is not so difficult to get some sound out of it. The Pipa is a four-stringed instrument with a pear-shaped body and a varying number of frets. Its origins are not so clear but presumably it was introduced in China from Central Asia around 2000 years ago. Modern Pipas have 24 frets and follow the 12 tone equal temperament scale, all frets spaced by a semitone. I attended a number of graduation concerts of traditional instruments at the Central Conservatory of Music in Beijing. One of them was a Pipa solo recital and I recorded some samples: 1, 2, 3. I was quite surprised by the repertoire in all the concerts; all were modern pieces composed in the last few decades, including some elements of traditional songs, but I would classify the music as virtuosistic post-romantic music, clearly influenced by the western classical music. I was expecting to hear some traditional pieces. I also heard the Pipa as part of the Chinese orchestras and in the Beijing opera but I will write about that later. 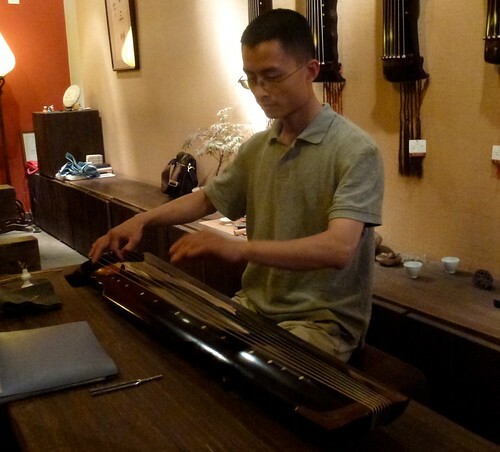 The Guzheng is a plucked zither with many strings (18-23 or more) and movable bridges. It originated over 2500 years ago in China and the tuning of the open strings is pentatonic (typically on C as sequences of C-D-E-G-A). It has become quite popular for many styles of Chinese music. The solo recital I attended at the Central Conservatory of Music in Beijing (sample recording) was of the modern classical style I just mentioned for the case of the Pipa, very virtuosistic music. In these graduation concerts it was also interesting the particular protocols used, different from what I was accustomed to, such as the use of a presenter to introduce the performer and the music, or the huge number of flower bouquets given at the end of each piece. The Sheng is a mouth-blown free reed instrument consisting of vertical pipes. The modern instruments have 36 pipes tuned chromatically in an equal temperament scale and are available in various registers. It is also very old, it is commonly used as an accompaniment instrument and I heard it as part of various ensembles. I saw many Shengs (picture) at a fair that I attended in Beijing, the 20th China International Exhibition on Pro Audio, Light, Music and Technology. I was amazed by the dimension of this fair, the section on traditional musical instruments was huge, including several hundred shops displaying all kinds of instruments and components to build instruments. From what I learned, the Erhu is clearly the most popular traditional instrument. It is a two-stringed bowed instrument that can be traced back to instruments introduced in China around the 10th century. It has no fingerboard, the player stops the strings by pressing the fingertips onto the strings without the strings touching the neck. The horse hair bow passes between the two strings, which are not separated, thus the player's left hand in effect plays as if on one string. The strings are generally tuned to D4 and A4 and the usual playing range is about two and a half octaves. The Erhu solo recitals I attended at the Central Conservatory of Music (1, 2) were also of the classical modern style, but given that the Erhu is related to the violin, the concerts also included adaptations of western classical pieces. The Erhu belongs to the Huqin family of instruments which includes other instruments covering different pitch ranges. The Dizi is a transverse flute made of bamboo with a very particular feature, it has a hole between the embouchure and the finger-holes covered by a membrane made from the inner skin of bamboo that creates a distinctive buzzing sound. I attended a Dizi graduation concert (1) and I bought one instrument (picture 1, picture 2). A challenge has been to glue the membrane into the instrument to produce the appropriate buzzingness. Related to the acoustics of the Dizi, and of the traditional Chinese instrument in general, I attended the Acoustics 2012 conference in Hong-Kong in the middle of May where two sessions were dedicated to traditional Asian instruments, one on string instruments and another on wind instruments. Three papers were presented on the acoustics of the Diz (Samejima et al., 2012; Odaka, 2012; Tsai, 2012), mainly focusing on the properties resonating hole and the membrane. The Xiao is a vertical end-blown flute made of bamboo. It gives a very different tone than the Dizi, being much more mellow. I recorded a student of the Chinese Conservatory of Music of Beijing: 1, 2. At the Guqin concert I attended a number of pieces were played by a Xiao and accompanied by the Qugin, like in this fragment. The modern Chinese orchestra is a 20th century development composed of Chinese instruments but very much based on the Western symphony orchestra model. Given that there are no low-pitched traditional instruments the orchestra also includes Western cello and double bass to cover that range. The orchestra has four sections: bowed strings, plucked strings, woodwinds, and percussion. The string section is composed of various instruments related to the Erhu, from the Huqin instrument family, plus the cello and double bass, covering all the pitch range used in western classical orchestras. The plucked string section is the one most different from the western orchestras, and a part from the Pipa and the Guzheng, this section also includes the Yangqin, Liuqin, Zhongruan, Daruan, and the Sanxian. The woodwind section is composed of the Dizi, Sheng and Suona. The percussion section can be very diverse, given the great variety of Chinese percussion instruments. The most common percussion instruments are Gongs (Luo), Bangu, Cymbals, and Tanggu. Given that these orchestras have only been in existence for a few decades their repertoire is quite modern. It comprises modernised traditional music, guoyue, newly composed music very much influenced by the western styles developed in the 20th century, or adaptations of western classical pieces. One of the graduations recitals I attended at the Central Conservatory of Music in Beijing involved a Chinese orchestra and I recorded several samples: 1, 2, 3. I also attended a rehearsal of the Chinese Orchestra of the Pekin University and I recorded some samples: 1, 2, 3, 4, 5, 6, 7, 8. After listening to these concerts I clearly recognized the timbre personality of the Chinese orchestra and I understood that many of the pieces use elements of Chinese traditional music, but the overall impression is that the modernisation that has taken place has been very much influenced by the Western classical tradition. The Beijing opera is one of the most important opera traditions in China. It was developed in the 18th century by combining characteristics of various older forms and it is maintained quite alive by a number of opera companies. The operas are very theatrical and combine music, vocal performance, mime, dance and acrobatics. The accompanying music ensemble includes bowed and plucked string instruments, woodwinds, and percussion. The leading bowed instrument is the Jinghu, which is the smallest and highest pitched instrument in the huqin family (really high pitched!!). Plucked stringed instruments include Yueqin, Pipa, and Xianzi. As woodwinds the Suona and the Dizi are sometimes used. The main percussion instruments are gongs and drums of various sizes and shapes together with clappers made of hardwood or bamboo. The orchestra is led by a Bangu drummer, who uses bamboo sticks to create very powerful and bright sounds (it sounds like a wood clapper but it is really a skin drum). The singing is quite particular, mainly by the use of falsetto voice and a slow vibrato. Johan Sundberg presented a study of this type of voices in Acoustics 2012 (Sundberg et al., 2012), describing the differences with the western operatic voices. I attended an Opera in Beijing that was a compilation of opera fragments in dedication to one of the most famous Beijing opera singers, Mei Lanfang, who always sang female parts with falsetto voice (Dan role). I recorded a few sounds, including orchestral samples: 1, 2, 3; samples of the Dan role: 1, 2, 3, 4; and samples of the male part: 1, 2, 3, 4. I also recorded some samples in an opera recital in which mostly amateur people sang: 1, 2. Together with the Guqin music, the Beijing opera is where I saw most clearly an old Chinese tradition with very distinct characteristics being maintained. It was not possible for me to grasp most of the opera features but I got the feeling that there might be very interesting musical issues to be understood. For example the relationship between language and music seems to be particularly interesting in the case of chinese music. The fact that all the chinese languages (dialects as they are called in china) are tonal and that each opera style (beijing opera being one of them) relates to a particular language is a clear sign of this relationship. Also there are many folk music traditions in China, and again, each tradition is very much related to a language. But this study requires a big understanding of the chinese languages and I will have to find some chinese researchers to help with that. During this trip to China I was not able to go into much depth on anything, language was a big barrier. There is a lot of information available and I met many knowledgeable people, but practically all texts are in Chinese and most musicians cannot communicate in english. So I will have to work much harder to understand a bit better this huge and fascinating musical tradition.